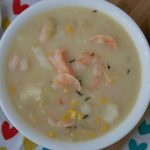 Weight Watchers Instant Pot Potato and Shrimp Soup is a hearty, filling soup that is so easy to make in your electric pressure cooker. First set the Instant Pot to Sauté and add the butter, garlic, onions and corn. Stir and cook until onions are cooked. Now it is time to add the broth and potatoes, thyme and bay leaf. This has 8 servings that are one cup each. Each cup is about 3.25 Freestyle SmartPoints.